Addicted to logging to free public WiFi wireless hotspots? Nowadays plenty of places, such Starbucks Coffee, McDonald’s, Coffee Beans and Tea Leaf, KFC, airports, libraries, community centers and eateries offering free Wi-Fi access connections as a way to attract customers. There are even more wireless access points that been broadcasting without any WEP, WPA or WPA2 encryption for everybody to connect without any crack. As good as free is, there is some cons and disadvantages free Wi-Fi hotspots too. The main concern is security. Unlike wired network which depends on physical access control on security. For wireless access point, if you can connect to the WiFi without a password and browse the Internet, so do everyone else around. Been a public wireless hotspot also means that the network connectivity from laptop to the AP is not encrypted plain text, and hackers or someone with malicious intent can easily sniff the data, credit card numbers, user name and passwords credentials transmitted with a sniffer such as WireShack. Hotspot Shield, a product of AnchorFree, is a security solution that helps to fix and solve unencrypted wireless network connection issue. Hotspot Shield keeps the Internet connection secure and anonymous on public networks by creating a virtual private network (VPN) between the notebook, laptop, desktop computer or iPhone and AnchorFree Internet gateway. This impenetrable tunnel prevents snoopers and hackers from viewing users’ email, instant messages, credit card information or anything else you send over the network, unlike XeroBank Browser which protects only web browsing using its own product. Of course, whether you want to trust or believe the data transmitted over the Hotspot Shield server is another issue, but at least it protects Internet connection from local sniffers. To use Hotspot Shield, simply download and install the Hotspot Shield setup installer from here. Hotspot Shield is available for Windows, macOS, iOS, Android and Chrome browser. Run Hotspot Shield by double clicking on Hotspot Shield Launch shortcut on desktop or Start menu. A Hotspot Shield icon will be displayed on system tray or notification area. 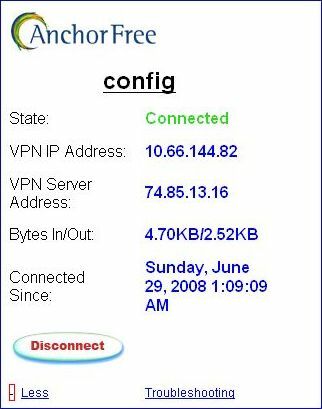 To connect to Internet via Hotspot Shield VPN, simply select Connect by right clicking on the icon, or browse directly to http://www.hotspotshield.com/launch/, and then click on Run Hotspot Shield green button. Hotspot Shield client will start VPN process of waiting for server response authentication, pulling options, assigning IP address and checking for updates. Once connected, the whole outgoing and incoming network traffic is tunneling through the secure Hotspot Shield VPN. However, using Hotspot Shield will subject users to constant advertisements in the form of automatic refresh leaderboard banner ads bar, which taken up the precious top screen estate. Any attempt to remove the Hotspot Shield ads will have the ads bar back on next page loads. Besides, free usage of Hotspot Shield is also limited to 3GB of bandwidth within a rolling 30 day window, although additional bandwidth may be purchased. Other than securing the WiFi connection, Hotspot Shield does have some unintended functions too. For example, as the VPN servers are located in United States of America with IP address translated to US location, it can be used to view contents restricted only to audience in USA. Beside, disconnect and reconnect to Hotspot Shield VPN server will normally assign a new IP address to the client, thus allowing user to bypass web services limitations based on IP address or country, although download speed may be slow.